During the award ceremony, outstanding dealer partners from each sub-region were rewarded in different categories ranging from distribution partner with the Highest Sales per region to the distribution partner with the Highest Sales Volume, National Growth Champion and the distribution partner with the Best Overall Performance. Like in previous editions, the winning partners were presented with glittering plaques, certificates and prizes ranging from ½ Ton Trucks, four ton trucks and six Ton Trucks to brand new pickups. Other prizes include big screen LED 3D Smart TVs, laptops, among others. The award for the Best Overall Distributor (National) went to Edinho Nigeria Limited (Abuja) represented at the event by the Managing Director, Dr. Chief Edmond Okafor who was awarded a 6-ton Canter Truck. First runner in the category, Mr. Banjo Onanubi of Cryslad Nigeria Limited went home with a 4-ton Canter Truck, while the second runner up, Dame Joy Igwe of Ifeoma Chukwuka Nigeria Limited won a pick-up van. Football fans in the Garden City were thrilled on Sunday August 25, 2013 when Harp Premium Lager gave them a spectacular experience at the star match between Dolphin FC and Enugu Rangers. Harp, official sponsor of the two opposing teams in addition to three others in the NPFL used this opportunity to bring fun and entertainment to the match between these two epic teams. Entry to the stadium was free for all fans as the gates were thrown open courtesy of the number one beer for friendship. The Harp Arena within the stadium grounds was a special treat for fans, highlights included penalty shoot-out and ball juggling competitions, beer sampling as well as a raffle draw that saw lucky consumers walking away with prizes such as blackberries, generators and freezers. Marketing Manager, Harp Lager, Paul Asemota, said the beer saw an opportunity to connect with and also reward fans and consumers. “This reflects our commitment to enhance the experience of football fans across the country. Harp, the number one beer for friendship, is associated with vibrancy, fun and boldness; we definitely promise the fans more fun as they continue to support the Local League”. Harp also made the game especially memorable for five fans who won a special experience in a Facebook contest, as they got a chance to meet and interact with some of the players. The keenly contested encounter saw Dolphins FC edge out Enugu Rangers FC by two goals to nothing. 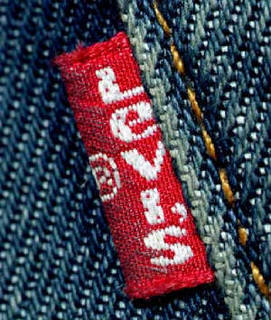 The Levi’s brand has announced a series of significant management changes to provide a new leadership structure that will drive innovative product and consumer engagement campaigns around the globe. The changes are effective immediately. Jennifer Sey, the current senior vice president of e-commerce, will become the global chief marketing officer for the Levi’s brand, responsible for marketing strategies across all of the Levi’s brand product categories. She will report to James Curleigh. Ms. Sey has had a successful marketing career spanning more than 20 years. She joined Levi Strauss & Co. in 1999 and has held a variety of leadership positions, including senior vice president of marketing for Dockers brand and vice president of global marketing for the Levi’s brand. Karyn Hillman joins the company in the newly created position of chief product officer for the Levi’s brand. In this role, Ms. Hillman is responsible for developing innovative product assortments and creating compelling product stories across the men’s and women’s businesses worldwide. She will report to James Curleigh. Prior to that Ms. Hillman was a key leader at Gap Inc. for 20 years in a variety of roles, including senior vice president of merchandising for Gap brand where she oversaw women’s, men’s, accessories and Gap Body. After an exciting regional audition all is now set as the Maltina Dance All (MDA), the much awaited family dance show hits television screens across the nation and beyond. 13 out of the 25 family representatives that were selected during the regional audition were able to qualify their families for the show. The number would be further reduced to 10 families who will eventually be admitted into the MDA academy. The show will continue on a daily basis until the grand finale which will be held on September 21, 2013 at Eko Hotel and Suites, Lagos. Tagged the “The Evolution”, MDA has over the years attracted a cult following among Nigeria’s youths and families because of its ability to bring family members together. It will be beamed on Nigerian Television Authority (NTA) 5.30pm, Silverbird TV (STV) 8.00pm and Galaxy TV 8.00pm. After a gruelling and exciting regional audition in Port Harcourt, Abuja and Lagos, the judges selected the Ebute, Ebenezer, Dosa, Briggs, Ibrahim, Clement, Asiyefia, Ekado, Enweribe, Ikumoinein Tom, Ibeatuchie and Idundun families to vie for slots in the academy. N6 million and a brand new car is at stake in this year’s edition. The first and second Runners Up will also get N1million and N500, 000 respectively. The show, according to Mrs Ngozi Nkwoji, senior brand manager, Maltina, is renowned for “sharing happiness” and promoting togetherness with friends and loved ones. Speaking about the show, Mrs Ngozi Nkwoji, Senior Brand Manager Maltina stated that building any brand is a very long journey, “We are glad with where we are with Maltina today. We are very excited about the 7th season of MDA, 7 years is a long time for a show to still be relevant and we’re very glad Maltina through MDA continues to bring the brand experience of sharing happiness and fun to the consumer. We put a lot of work into it. Every year there is something bigger and better. What we are doing with Maltina Dance All is to “share happiness” and to also create more emotional connection with consumers because families and dance are two winning components in the Nigerian environment. Nigerians love to dance. Maltina is continuously nourishing millions of Nigerians. It’s still the most fortified malt drink in the market. It’s also the biggest malt brand in the market”. It would be recalled that the maiden 2007 edition produced the Onye family; in 2008 it was the Opuwari family that carted away the star prize; in 2009 the nation’s best dance family were the Ibiams, in 2010 the Adejoh’s held sway and in 2011 the Ekuboh’s showed Nigerians why they were crowned the number one dance family. In 2012 the Greens were crowned the best dance family with the unforgettable swinging moves of Opus and his sister. From all indications, MDA “The Evolution” will excite, entertain and enliven the family space more than the TV audience would ever anticipate. Evidently, the stakes are higher, dance instructors are ready to go and the Maltina brand is determined to enhance national family bond through the viable instrument of music and dance theatrics. Etisalat Nigeria has announced a promotion for its customers travelling for this year's Hajj. From 1 September, customers travelling to Saudi Arabia to perform the holy pilgrimage can enjoy discounted rates on local calls in Saudi Arabia, calls to Nigeria, SMS and data services. According to the company, calls to Nigeria will cost NGN 30 per minute, local calls within Saudi Arabia are NGN 30 per minute, SMS is priced at NGN 20 and a data package is available for as low as NGN 0.1 per KB. Also, all incoming calls and SMS received in the holy land during the promo period will be free of charge. The promo which is in its fourth year was designed to help customers stay in touch with their family, friends and business associates in several places across the globe including Saudi Arabia at a low cost. The promo will end by November 30, 2013. 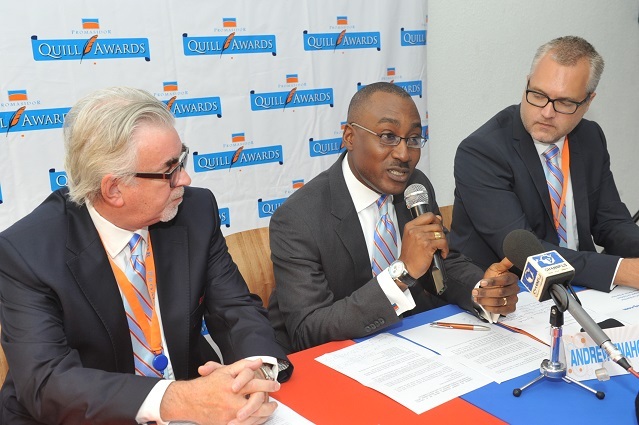 Managing Director, Promasidor Nigeria Limited, Chief Keith Richards, and Head, Legal and Public Relations, Promasidor Nigeria Limited, Andrew Enahoro and Strategy Director, Promasidor Nigeria Limited, Anders Einarsson all of Promasidor Nigeria Limited at the Promasidor Quill Awards 2013/2014 press conference held in Lagos recently. Entries for this year’s Promasidor Quill Awards for journalists will begin from 9th September 2013 through to 30th April 2014. The Managing Director Promasidor Nigeria Limited, makers of Cowbell milk, Chief Keith Richards, who made the disclosure at a press conference held in the company’s corporate headquarters in Lagos recently also explained that qualifying entries are publications from 1st April 2013 through to 30th April 2014. The awards were instituted in 2012 as a way of rewarding excellence in journalism in Nigeria for dedicated news reportage on industry, education, and corporate social responsibility & nutrition issues all year round. “Since we sold the first sachet of milk and grew our product brands across our dairy, beverage and food enhancement categories we have enjoyed and benefitted from the support of the media and committed journalists who have noticed our commitment and hard work. This year, Promasidor celebrates its 20th anniversary and our success over the years has been driven by the dedication of the media to promote our quality consumer brands. Since the 18th March, 2012 when this award was launched, we have joined the media world to celebrate five remarkable journalists who flagged off the maiden edition at the grand awards dinner at the Eko Hotel & Towers on 27th April, earlier this year,” he said. Richards explained that the Award winners received state-of-the-art tools for the trade and also are scheduled to begin a 6 weeks certificate-awarding course at the School of Media and Communications at the Pan African University, Lagos that will further equip them with new knowledge to do more. Commenting to the event, Mr. Andrew Enahoro, Head Legal and PR, Promasidor, said the award categories have been thoughtfully picked to encourage better journalist coverage of areas that are very important to society. Enahoro said the company included the brand advocate of the year to reward journalist that covers its brand activity in the market space. “All entry publication for each category seeks to reward excellent reportage about these issues as it concerns or affects society and industry. It has no bias regarding the content or the direction besides fulfilling the criteria for the awards,” he noted. 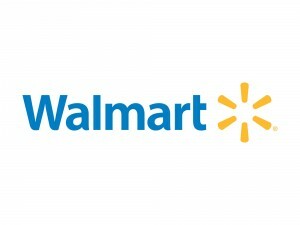 The report states that Walmart's strategy in Africa is unknown. It "will most likely target Africa's emerging middle and upper classes" unlike its U.S. strategy of being the lowest cost retailer. Walmart, keen to enter oil-rich markets such as Nigeria and Angola, is launching an aggressive plan to open up at least 90 stores in Sub-Saharan Africa over the next three years, according to a report in ValueWalk. Sky Sports has launched a new scholarship scheme that will help support twelve young athletes from Britain and Ireland over the next three years. 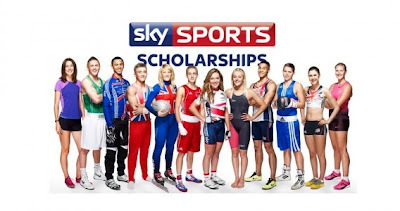 The scholarship marks the beginning of an exciting relationship between the athletes and Sky. It will provide a support network that is so important for the scholars. The twelve athletes awarded scholarships are: Jack Bateson (boxing), Holly Bleasdale (pole vault), Olivia Breen (sprints), Elise Christie (speed skating), Lucy Garner (cycling), Quillan Isidore (BMX), Jessica Judd (800m), Savannah Marshall (boxing), Siobhan O’Connor (swimming), Sam Oldham (gymnastics), Louis Persent (400m) and Jason Quigley (boxing). 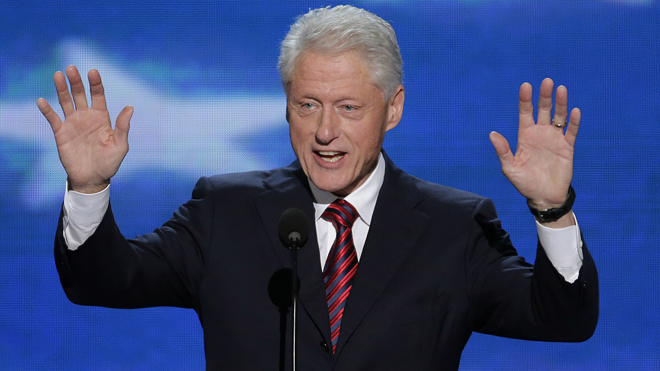 Former United States President Bill Clinton has hailed Procter and Gamble’s PUR initiatives for touching and improving lives. Clinton in company of his daughter Chelsea said this while visiting a school in Rwanda to see Procter and Gamble Purifier of Water packets at work. The visit was part of effort to strengthen commitment of P&G’s Clinton Global Initiative (CGI) towards provision of clean water in developing countries. To further deliver its commitment to provide global access to clean drinking water over the years, P&G has been working with partners to provide clean drinking water in developing countries for nearly a decade with its award-winning water purification technology otherwise known as PUR. To date, clean drinking water provided by P&G has saved an estimated 32,000 lives and prevented 250 million days of diarrheal illnesses across 71 countries. The powdered water purification product is a simple and effective way to make clean drinking water for the entire family, as the packets turns dirty, potentially deadly water into clean and drinkable water very quickly. The P&G Children’s Safe Drinking Water Program (CSDW) has been providing clean drinking water in developing countries for nearly a decade through its award-winning P&G Purifier of Water technology. From January 2008 to 2011, the ‘Safe Water for Nigerian Children’ project in partnership with non-governmental organisation, Society for Family Health (SFH) provided over 30 million litres of safe drinking water in semi-urban and rural communities through the use of P&G’s PUR Purifier of Water and also donated over 48,000 sachets of PUR, providing safe drinking water as a key component for disaster relief during the cholera outbreaks in 2010. PUR, which was developed jointly by Procter & Gamble and the U.S. Centers for Disease Control and Prevention, has been shown to reduce diarrheal illness by an average 50 per cent in controlled health intervention studies. Commercial Operations & Marketing Leader, General Electric (Oil & Gas) Tanya Spencer (L); Managing Director, General Electric( Health Care), Pamela Hall (2nd R); Executive Director, Women In Technology Empowerment Centre, Ore Somolu (R); presenting laptop to a student Adepiti Oyinlola at the GE Girls In Technology Day held In Lagos Friday August 16. Commercial Operations & Marketing Leader, General Electric (Oil & Gas) Tanya Spencer (L); Managing Director, General Electric( Health Care), Pamela Hall (2nd R); Executive Director, Women In Technology Empowerment Centre, Ore Somolu (R); presenting laptop to a student, Ogbeide Emmanuella. L- R: I T PMO Leader, General Electric, Rotola Ogunye ; Commercial Operations & Marketing Leader, General Electric (Oil & Gas) Tanya Spencer ; Executive Director, Women In Technology Empowerment Centre, Ore Somolu ;Managing Director, General Electric( Health Care), Pamela Hall, and Senior Counsel & Compliance Leader, GE, Ozim Obasi during the event. Leading global chip makers and sponsors of tomorrow, Intel Corporation has thrown its weight behind the first-ever technology camp for girls in Nigeria. The camp, set up by the Women’s Technology Empowerment Centre, is a two-week technology education and mentoring programme designed to help girls develop an early interest in computers and other information technology. Intel has over the years supported several girl-child education initiatives investing in technology-based programmes in education and digital literacy, and has championed the empowerment of women and girls, around the world. Working together with its wide range of partners across Africa and the world, Intel has created and supported innovative solutions to remove gender-based barriers to education and technology, and to build a flourishing future filled with opportunities for girls and women. Speaking on the initiative, the Executive Director of the Women’s Technology Empowerment Centre (W.TEC), Ms Oreoluwa Somolu, explained that the technology camp examines a variety of strategies that enable female students maximize their learning experiences and make them better equipped to pursue careers in technology. “In the long term, we hope to achieve a significant increase in the number of technology literate Nigerian women that will ultimately deploy the knowledge they have for productive learning, professional and leadership activities. 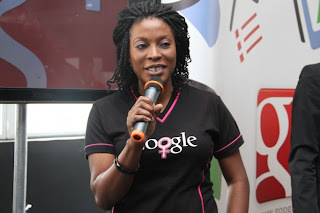 We also hope to increase the number of women creating and developing new technology and content,” She stated. The camp has run consistently for five years, throwing its doors open to secondary school students all over Nigeria and involving them in activities such as graphic design, movie-making, web design and introduction to programming. During the camp, the girls also participate in technology workshops and leadership activities for an all-round experience. Maltina Dance All (MDA), the consumer engagement platform of Maltina, the leading non-alcoholic malt brand from the stable of Nigerian Breweries plc has entered a crucial stage following the arrival of the lucky families that made it to the final screening of the competition and entry into the MDA academy. Of the 25 families that participated in the highly competitive screening process, only 13 made it to the final stage. Tagged “The Evolution”, MDA 7 is expected to feature the evolution of dance from the 1960s to date. The families, who came from different locations across the country, were in high spirits as they touched down at the domestic wing of Murtala Muhammed Airport, Ikeja Lagos for the academy. A breakdown of the families that made it as released by the brand showed that, Ebenezer, Briggs, Asiyefia, Tom, Ikumoinien, Dosa, Clement, Ibrahim, Ebute, Ekado, Ibeatuchie, Nweribe and Idundun families – having passed the necessary medical and other screenings - made it into the academy and were deemed fit to compete. A further screening will reduce the number from 13 families to 10, who will eventually qualify for the entry into the academy after going through the rigours of another screening at the ‘’Pre Ground Audition Evaluation’’. The academy commences on September 1, 2013. It would be recalled that the MDA auditions were held in three regions; Abuja, Lagos and Port Harcourt, where eight young regional family representatives emerged defeating other contestants during the regional auditions. The young family representatives performed as individual contestants and were later visited by the Maltina team at home where they performed alongside their families to see how well they can perform as united families. The sum of N6million and a brand new car are at stake in this season’s competition. The first and second runners-up will take home N1, 000,000 and N500, 000 respectively. If the flashmob scene experienced during the press briefing in June and the action at the regional auditions is anything to go by then consumers should be assured that the MDA 7 will bring to the fore, the Nigerian essence and values of sharing, happiness, unity, cooperation, vitality and creativity which have set the show apart from others. The show, which will hit the airwaves on September 1, 2013, will be shown on NTA (5.30 pm), Galaxy TV (8 pm) and Silverbird TV (8 pm), while the grand finale would be aired live on AIT and Africa Magic channels on DSTV. Viewers who miss any edition can still catch all the action on YouTube and Facebook. According to report on Reuters, Facebook Inc's Chief Executive Mark Zuckerberg has enlisted Samsung Electronics Co Ltd, Qualcomm Inc and four other companies for a project aimed at bringing Internet access to people around the world who cannot afford it, following efforts by Google Inc.
Internet.org, which was launched on Wednesday, will focus on seeking ways to help the 5 billion people - or two-thirds of the world's population - who do not have Internet access, come online, the company said in a statement. 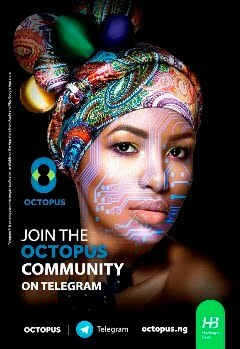 The partnership's potential projects will include the development of lower-cost smartphones and the deployment of Internet access in underserved communities as well as working on ways to reduce the amount of data downloads required to run Internet applications, according to Facebook. Following the strong response with applicants from more than 72 countries for the first Lexus Design Award, Lexus is looking for a new wave of next-generation innovators to benefit from the second Lexus Design Award, an international design competition. The application which commenced on August 1st will close on October 15, 2013. To challenge and inspire this year’s entrants, applying curiosity will be this year’s Lexus Design Award theme. Lexus welcomes designers from all fields, such as architecture, product design and fashion. The Lexus Design Award provides an opportunity for the winners to showcase their works while receiving feedback from world-renowned design professionals. Additionally, two winners will work with a famous designer as a mentor to create prototypes of their designs. Through this initiative, Lexus hopes to encourage the next generation of creators. Lexus designers and engineers spend a great deal of time thinking about the serious matter of how to improve our designs and their impact on the world. It is also important that what Lexus builds is exhilarating for our customers. Applying curiosity in a creative manner can result in unexpected innovations that change lives. The 12 winners will be announced in early 2014, and their works will be exhibited during Milan Design Week 2014. Africa News Network 7 (ANN7) officially launched yesterday in South Africa, heralding a new era in news broadcasting which will give ordinary South Africans access to all sides on stories of national importance. ANN7 which becomes the third local news channels on DStv will be available to DStv customers with the following packages: DStv Access, DStv Family, DStv Compact, DStv Extra and DStv Premium. Staffed by a team of over 150 journalists with experience in leading newsrooms like SKY and Al Jazeera, ANN7 will have dedicated teams for the different segments ranging from politics, to business, sports and entertainment news. Among some of the names that will be leading the programming at ANN7 are Chantal Rutter Dros who will be hosting prime time shows ANN7 Headlines and ANN7 Prime, Gerry Rantseli-Elsdon will host Vuka Africa, Kwaito pioneer Arthur Mafokate will host a weekly flagship sport show Hola Weekend and Jimmy Manyi will be hosting a weekly hard talk show Straight Talk. African Voices, the weekly show that highlights Africa's most engaging personalities, will this week feature Nigerian native Patricia Mawa and Ugandan born Moses Mawa, the power couple who use media to bring African culture to Canada. In an interview with CNN’s Paula Newton, they share how a chance meeting in Canada became a partnership that is behind both a budding media empire, and a loving marriage. 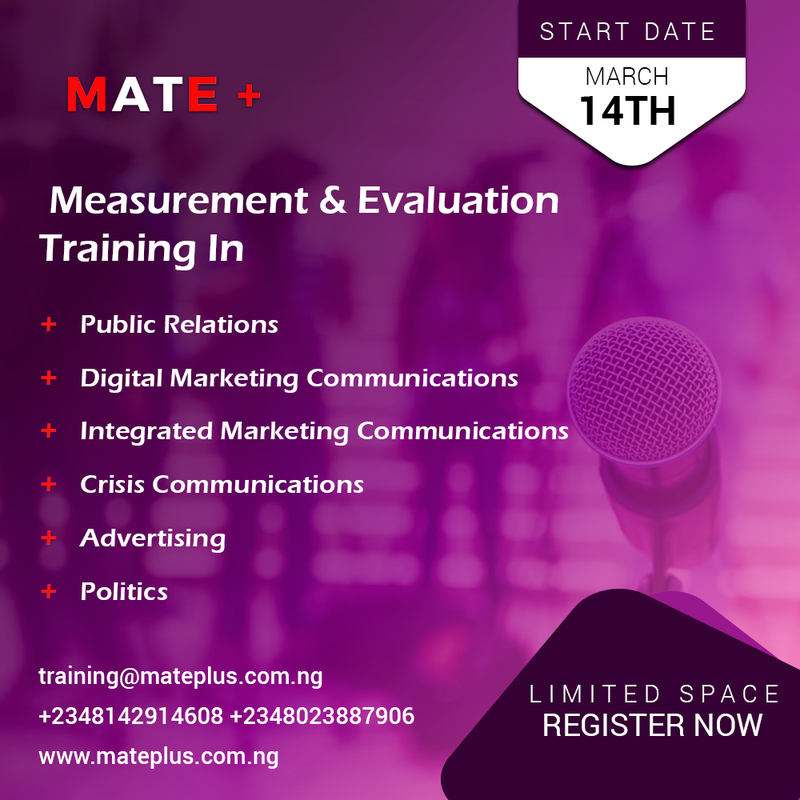 The Mawas are at the helm of Silver Trust Media, which manages two television programs and three magazine publications as well as production and marketing for clients that range from local businesses to international embassies. The third part of the organization is the Destiny brand. “We have Destiny magazine at this moment. In 2005, we actually launched a show called Destiny Television which focuses on profiles and stories with a sort of Christian content,” he said. Patricia Mawa is not only her husband's partner in all of this, but she is also the host of ‘Planet Africa’, a weekly program that focuses on African culture and current affairs. For the past nine years, Moses and Patricia Mawa have planned and produced the Planet Africa Awards gala in Toronto, Canada; a glitzy affair that recognizes people of African descent for their contributions to the society. Lenovo, world's number one PC supplier, will be blazing a trail by being the first company to create a uniquely African Android statue. 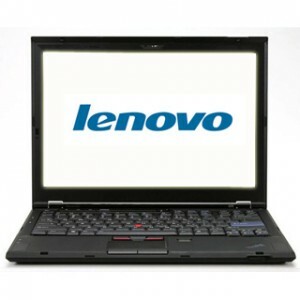 This landmark campaign is to commemorate the launch of the Lenovo A1000, A3000 and S6000 Android tablets in Africa. 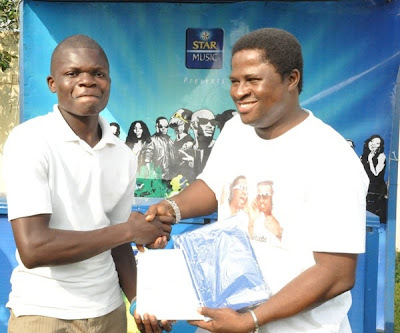 Friday, 16th August, 2013 will linger on for a long time in the mind of Chikelu Obijiofor, a student of Abia State Polytechnic, Aba who won himself the star prize of Kia Picanto car when innovative telecommunication company, Etisalat stormed his institution with its Cliqfest Seminar/Concert. The young lad who expressed his gratitude to the '9ja 4 life' company, thanked the company for organizing the event in his school. L-R: Specialist, Merchandising and Communication, Etisalat Nigeria, Withney Nwibani; Specialist, Youth Market Segment, Etisalat Nigeria, Ifeoluwa Oyeyipo; Etisalat Cliqfest Star Prize Winner of a Kia Picanto, Chikelu Obijiofor, Dean of Students Affairs, Abia State Polytechnic, Mr. Ojo Obasi and Specialist, Events and Sponsorship, Etisalat Nigeria, Dayo Adeyelure, during the raffle draw prize presentation at Etisalat Cliqfest, held at Abia State Polytechnic, Aba. 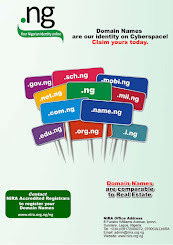 Relevant local content is key to the development of the internet in Nigeria. When the local YouTube domain was launched in Nigeria in 2011, no one could have guessed the amount of impact it would make. From Musical videos, to "how-to” DIY clips, comedy skits, short movies Nigerians have been generating some of the most creatively diverse content on YouTube. To further support local creators, the YouTube Partner Program has now been extended to Nigeria. What this means is that Nigerian YouTube users are now going to be able to make money on their videos, and gain access to resources and programs that can help them expand to a larger audience. So whether it’s a banker who dreams of moonlighting as a comedian, or a young animator in Unilag working on an animation series, or a seasoned makeup artist looking to showcase her talent to a wider audience, the YouTube Partner Program provides an opportunity for them to share to a worldwide audience and earn money doing so. Not only individuals benefit from the YouTube platform - brands do too. Brands are able to connect to their audience through various targeting methods. Whether it be based on demographics, interest, topics, keywords and specific video's or YouTube channels, advertisers will be able to make sure they are as relevant as possible. With the most well-known ad format being "true--view" in-stream ads, brands are only charged once the viewer has chosen to engage with their content. This "Cost Per View" model is first of its kind and ensures brands get the most out of their spend. Google Nigeria's Country Manager, Juliet Ehimuan-Chiazor said “We are excited about the amazing opportunities the YouTube Partner Program will create for Nigerian content creators to engage and build a global audience for their content.” “This program will definitely enrich the diversity of the YouTube community and bring more Nigerian content to the web” She added. 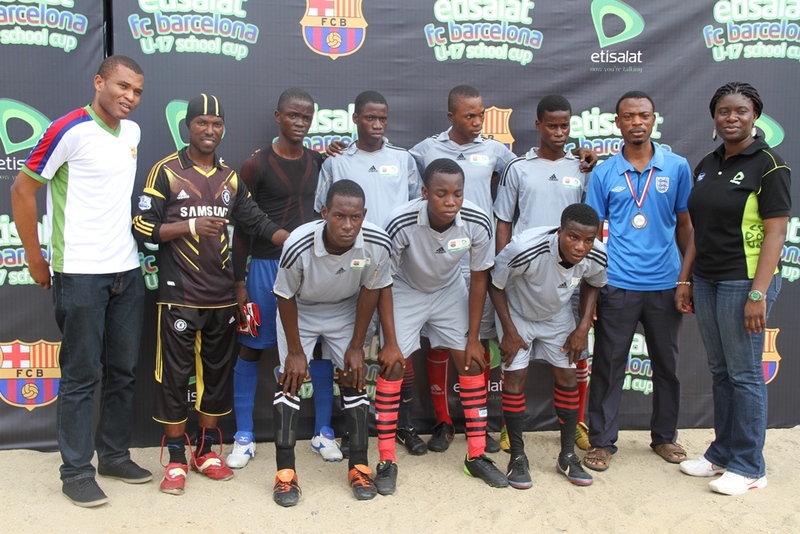 Keke Senior High School, Ijaiye Estate in Lagos made history on Saturday, August 17, 2013 as it became the first school to win the maiden edition of the Etisalat FCB Under-17 School Cup. The school beat Anthony Village Senior High School by 4 goals to nil to cart home the trophy after a thrilling final game played at the Campos Mini-Stadium, Lagos Island. Director, Consumer Segment, Etisalat Nigeria, Oluwole Rawa (4th left), presenting trophy to winner of the Etisalat/FC Barcelona U-17 Schools' Cup, Keke Senior High School, at the grand finale of Etisalat/FC Barcelona U-17 Schools' Cup, held at Campus Square Stadium, Obalende, Lagos, on 17th August. For its feat, the school also took home the star prize, a N1 million educational award, a smartphone for each of the heroic players, as well as an all expense paid trip to the United Arab Emirates, where they are scheduled to play a friendly match with the football team of a local school. First runner-up, Anthony Village Senior High School went home with N750,000 and mobile phones for each of the players. The second runner-up, Akande Dahunsi Senior Memorial High School, who beat Magbo Alade Senior Grammar School, Ibeju Lekki by 3 goals to 1 on penalties after a goalless draw also received the sum of N500,000 naira and other Etisalat-branded items. Speaking at the occasion, Director, Retail Sales, Etisalat Nigeria, Mr. Charles Ogunwuyi expressed satisfaction with the level of the competition as well as the passion displayed by the teams. “Sixteen secondary schools began with us at the Preliminaries on August 1, while eight teams were eliminated at the quarter-finals stage. All the schools were selected by the Lagos State Ministry of Education and the Lagos State Football Association. 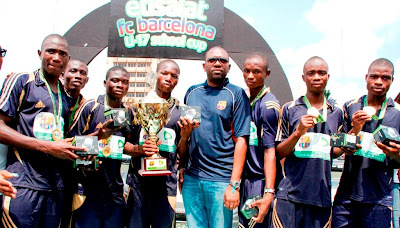 The Etisalat FCB U-17 School Cup is our own way of providing another opportunity for young football lovers to express their passion for the game and be rewarded for it, just as we are doing with the ongoing FC Barcelona Promo,” he said. Ogunwuyi explained that the U-17 Competition was an innovative platform created especially for young people who are fans of FC Barcelona and the game of football generally. “Etisalat has been the official telecommunications partner for FC Barcelona since 2009. We hope these young players will keep their passion for the game and remember these experiences. We believe in rewarding hard work and having fun at it,” he said. Doctor's On Air Medical Mission, an offshoot of a radio-based health education program dedicated to enlightening people about common and not so common diseases, recently held its third annual free health screening exercise in Yaba, Local Community Development Area in Lagos. The event which was organised by PathCare Nigeria, in collaboration with Classic FM and other supporting partners, featured a host of volunteers from the medical field and a wide range of free medical tests including blood pressure, blood sugar, body mass index, lipid, cholesterol, kidney test, eye test, diabetes test, breast examination, cervical cancer screening, urinalysis among others were carried out on over 2500 participants who turned out for the exercise. Chairman of Yaba Local Government, Honourable Olajide Jimoh, in his welcome speech commended the Doctors on Air Medical Mission as a very laudable initiate that impacts directly on the lives of the masses. He said "we are very appreciative of the kind gesture that Doctors On Air Medical Mission has brought to our people in Yaba LCDA because health is a very key factor in the life of every community. "Yaba happens to be the political barometer of Lagos State where we have larger number of people both enlightened and otherwise. We have nothing less than eight higher institutions, which gives you an idea of the large number of youths that we have to cater for in addition to the elderlies, the widows, women and children. The large turnout gives one an idea of how much this gesture is welcomed by the people in Yaba. It is also a rear opportunity for a lot of people because of the quality of medical personnel that are involved." The Chairman, who participated fully in the exercise and got a clean bill of health, appealed to other Non-Governmental Organisations and Corporate bodies to emulate the example that is being set by the Doctors On Air Medical Mission. He said "I will like to solicit for more support from other well-meaning organisations in creating better chances to good life for our people. Government cannot do it alone. " The Managing Director of PathCare, Dr. Pamela Ajayi, commended the turnout, adding that health consciousness, which the Doctors on Air Medical Mission promotes is key to healthy living. "The whole goal of the annual Doctors On Air Medical Mission is to give access to world class medical attention to people who ordinarily will not have access to such. The project covers a very wide range of tests for both children and adults which is made possible by the contribution of our various partners. Apart from the free medical tests that are carried out, we also have free drugs that have been donated by partners and are dispensed by pharmacists to participants as needed at the event. During their Gamescom 2013 presentation, held recently, Group CEO of Sony Computer Entertainment, Andrew House announced the launch date for the PlayStation 4 and also revealed the list of countries which will be first in line to receive the next-generation PlayStation 4 console upon release. In a press statement, Mario Dos Santos, Chief Executive Officer of Ster Kinekor Entertainment, said the PlayStation 4 will arrive in South Africa before Christmas. 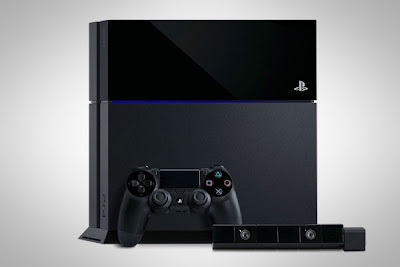 “South Africa will be releasing the PlayStation 4 prior to Christmas, we are planned to go on the 6th of December 2013 due to the logistics of getting the stock to our shores,” said Dos Santos. “The price point, although not officially set due to the uncertainty around the Rand exchange rate, is currently planned at an RRP of R 6299 including VAT and it will not be beyond this for launch,” he stated. The excitement generated by the just concluded Star League Text & Play campaign has refused to die down because it heralded one of the most exciting innovations in rewarding loyal consumers. As the excitement continues, it recorded yet another commendable feat when iPads and other devices were delivered to the homes of winners in Lagos as was done in other parts of the country. (R-L) Brand Manager Star, Omotunde Adenusi presenting iPad to one of the winners of Star League, Valentine Segenge in Lagos. Odumole Abiodun of No15, Adeshina Street, Ijesha Road Surulere Lagos had surprise written all over his face when his customised iPad was delivered to him at home. The same experience was re-enacted when the team visited Nebo Afam of No 11, Bellow Street Ikosi-Ketu, Lagos, where his customised iPad was also presented to him. “I Said to myself this must be one huge joke”, Odumole said, “But when I saw the determination and smile on the face of the despatch rider that presented the prize to me I knew it was for real. I shouted because I have been planning for months on how to buy an iPad, you know it’s the in thing now.” His shout eventually attracted his neighbours who thought something bad might have happened to him, but they only saw an elated Odumole waving his iPad around. The same scenario played out at Afam’s residence where his neighbours also came out to rejoice with him and to also commend Star for the innovation. An employee of one of the renowned Telecommunications Company, he thanked Star for the unique way his prize was presented. The brand did not stop there; it also presented iPads to Valentine Segenge, Friday Okotex, Joe Zack and Duke Unusotame at LASU Museum, Agege also in Lagos. They were also full of praises for Star for its creativity and the fact that they enjoyed the league while it lasted and that their prizes were delivered personally to them without protocol. Speaking at the prize presentation events, Omotunde Adenusi, Brand Manager Star, said the brand is redeeming the promise it made to consumers at the commencement of the league. “We are constantly looking out for revolutionary and creative ways to excite, engage and reward our consumers. It gladdens my heart that people have come to love it. We believe that there is no limit to what one can achieve”. Microsoft 4Afrika and University of the People have partnered to offer scholarships to students wishing to study towards an Associate's Degree with UoPeople. Through the program UoPeople and Microsoft will support 1,000 African students to graduate with a world-class academic degree from UoPeople, helping to change the lives of the students, their families and communities and ultimately transforming the continent. Scholarship recipients will also be eligible to further enhance their skills and work experience through participation in additional support programs, including mentorship, training, internship and employment opportunities at Microsoft and their partner companies. Applicants from all African countries are invited to apply for the scholarship opportunity to study towards their associate degree, supported by Microsoft. Interested applicants are to complete the UoPeople online application. Applicants will be invited to submit a request for financial aid from the Microsoft 4Afrika scholarship program. Airtel Ghana is rewarding its valued customers for their loyalty and dedication on the network over the years by celebrating their birthdays and network anniversaries with them. The lucky customers receive a bouquet of gift items ranging from airtime, branded mobile devices, personalized cards to beautifully branded yummy cakes and complementary bottles of choice red wines. Head of Corporate Communications at Airtel Ghana, Donald Gwira, announced that in addition to celebrating with customers’ important milestones, Airtel is also committed to enhancing customer experienceas gathered through consumer insights. “We recently upgraded our data subscription platform where customers can now top up their data bundles before the expiration date. Previously, subscribers had to wait for the data bundles to expire before topping up”, He said. 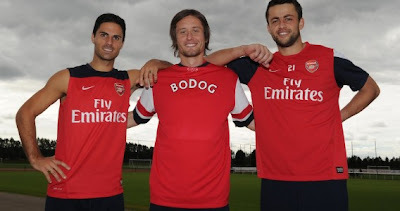 Following a successful 2013 preseason tour to Indonesia, Vietnam and Japan, Arsenal today welcomes Bodog Casino as its official Asian betting partner in a three-year, multi-million pound deal. In line with its Corporate Social Responsibility, online mega store, Jumia.com.ng, recently partnered with the '1 Child, 1 Book' an initiative of the Tosin Jegede Foundation to deliver free books to pupils of the Ojota Primary School in Lagos. Others in attendance were representatives of DHL and First City Monument Bank co-sponsors of the event. Also in attendance were representatives from the local government and state government. In pushing this initiative further, for any book bought on jumia.com a book is donated to the '1 Child, 1 Book' for a kid who can't afford one. 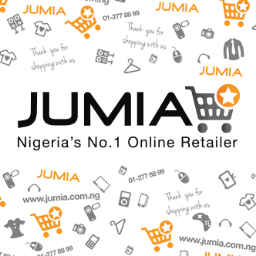 JUMIA provides its customers with a one stop shopping experience that is convenient, safe and stress-free. It has become Nigeria #1 e-commerce platform, with every day, over 100,000 unique visitors and a daily subscriber base of over 400,000 people. The Easyblaze Experiential Lounge by Nigeria’s most innovative telecommunications company, Etisalat, has ignited Port Harcourt and Abuja with an experiential campaign of its 3.75G High Speed Packet Access (HSPA) broadband service known as Easyblaze. The tour, billed for 24 states of Nigeria serves as an enlightenment and engagement scheme for existing and potential customers, in line with Etisalat’s customer-centric profile to provide them an opportunity to experience the Easyblaze broadband service on a variety of internet-enabled mobile devices including Smartphones, tablets, laptops, and MiFi hotspots. The Easyblaze 3.75G offers high speed data of up to 42mbps, allowing Etisalat customers to enjoy quick and uninterrupted internet access, with faster file downloads, video streaming and other web-based activities. According to Rawa, “this road show is to give our customers the opportunity to experience our 3.75G Easyblaze network built on Next Generation HSPA+ network with dual carrier technology capable of downloading speed of up to 42 Megabytes per second (Mbps). The experiential lounge buses which will tour the cities of Abuja and Port Harcourt throughout August will be positioned at prominent, high foot-traffic areas in a bid to engage with both cities’ residents. Etisalat advisors will be on hand on the tour to demonstrate the best ways to enjoy the full potential of the EasyBlaze package, using internet-enabled devices. Having revealed its plans to establish Africa's first Oracle Advanced Solution Centre in Lagos about a year ago, world leading Software Company, Oracle Incorporated, has finally opened the centre. The multi-million naira Solution centre is to help digital growth in Nigeria’s economy while ensuring that people understand what Oracle can do with its expertise and knowledge in the IT sector coupled with what its strategy of simplifying IT means for them. The solution centre will oversee all Oracle hardware and software solutions to suit customer benefits. The quarter-final matches of the ongoing Etisalat FC Barcelona U-17 Schools’ Cup lived up to expectations of fun, excitement, and display of talents. The matches which were played at the Campus Stadium, Lagos Island was also filled with lots of joy as four teams made it to the semi finals stage of the competition, with their opponents exiting, amid tears. The semi finalists are Akande Dahunsi Senior Memorial High School, Ikoyi; Magbo Alade Senior Grammer School, Ibeju, Lekki; Keke Senior High School, Ifako Ijaye and Anthony Village Senior High School, Anthony Village, Lagos. The losing quarter finalists include Sango Senior Secondary School, Agege; Obele Community Senior High School, Surulere; Ogunmodede Senior College, Epe, and Ajumoni Senior Secondary School, Mushin. 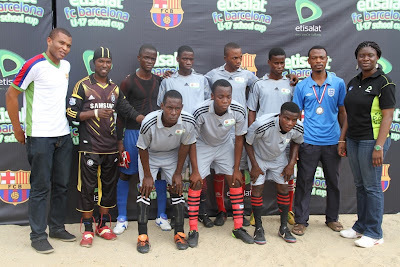 Commenting on the success of the quarter final matches, Manager, Sponsorships at Etisalat Nigeria, Orah Egwu commended the teams for their display of exceptional skills, saying that this portends a bright future for Nigerian football. According to him, this was what Etisalat had in mind when it came up with the idea of organising the competition. He congratulated the semi finalists on their victory, and also urged the losing teams not to be disappointed, but see it as a challenge for improvement. Team members, supporters and coaches of the qualifying teams could not hide their joy at the final whistle. Samuel Ajala, Head Coach, Keke Senior High School whose team pummeled Obele Community Senior High School 5-1 to reach the semi finals said the side can only get better. “I am very happy that we came out victorious in our match. We really played well, even though we could have won with more goals,” he said. In other matches, Akande Dahunsi Senior Memorial High School beat Ajumoni Senior Secondary School 1-0; Magbo Alade Senior Grammer School beat Sango Senior Secondary School 3-2 on penalties, while Anthony Village Senior High School thrashed Ogunmodede Senior College 4-1. The semi-final matches come up on August 14, at the Campus Square football field, Obalende, Lagos Island. Head, Sales Support & Operations, Etisalat Nigeria, Victor Nwaobia (first right) presenting the key to a Toyota Hilux to Deputy Governor of Imo State, His Excellency Prince Eze Madumere (MFR) (first left), during the Etisalat donation to Security agencies in Imo State, held at Imo State, today, Thursday, 8th August. With them are, Deputy Director, Network Deployment, Etisalat Nigeria, Adekunle Durojaiye (second right) and Manager, Government Relations, Etisalat Nigeria, Mohammed Suleh-Yusuf, (second left). 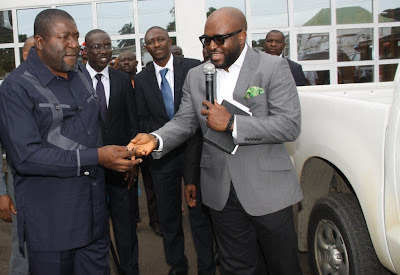 The donations made through the office of the Deputy Governor of the State, Prince Eze Anoruo Madumere included a brand new security patrol Toyota Hilux and Close User Group (CUG) lines to aid the State. Deputy Director, Technical at Etisalat Nigeria, Mr. Adekunle Durojaiye highlighted the company’s preparedness to continue to work with the State and community explained that this was part of an ongoing plan to engage as we continue to expand our network. In an attempt to ease the stress of its teeming subscribers, MTN Ghana has launched another innovative service called “ATM Cash Out”. ATM Cash Out offers Mobile Money subscribers the convenience and ease of withdrawing money instantly from ATMs anytime, anywhere without a card. The service is the first in Ghana and within the MTN Group. “MTN is committed to providing services that enable customers improve their lives through the use of digital devices and touch points available in the country. He said, “I believe the introduction of this innovative service to the Ghanaian market will enrich the user experience of customers”. Customers can now access their cash anytime, anywhere even when Merchant outlets have closed” said Eli Hini, the Senior Manager of MTN Mobile Money, in a statement by the company. The service is currently available at all Fidelity Bank (GH) ATM’s across the country and soon to be rolled out across all partner banks ATMs nationwide. 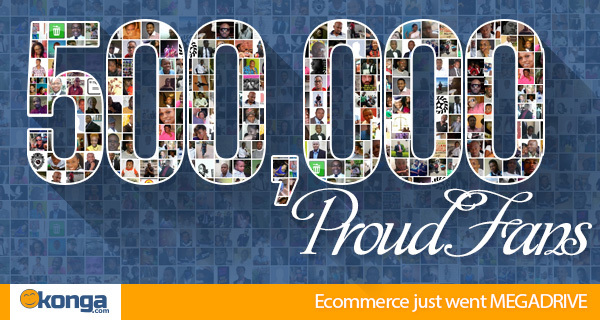 One of the leading e-commerce site in Nigeria, Konga.com, has half a million fans on its verified Facebook page. The online mega store thanked its fans for their continued support and comments on the page. "This time last year, we had only 2,000+ fans and today it’s 500,000+. We promise to continue to deliver stellar customer service, new innovative offerings and to make every Nigerian smile", a statement on it official blog reads. 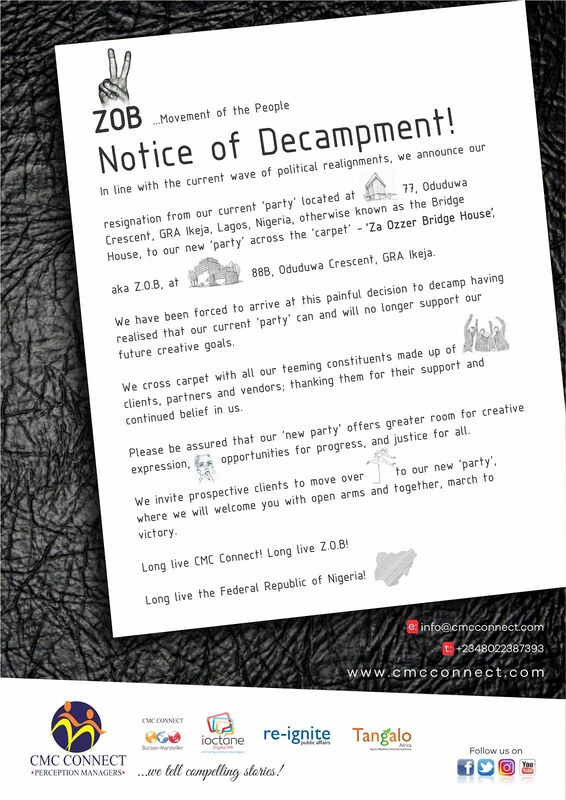 “We say a big thank you to every shopper, blogger, journalist, and to all Nigerians that have been a part of our Journey so far,” the company added. After several weeks of conflicts between YouTube and Windows Phone, Microsoft’s YouTube app for Windows Phone is now back. "We've released an updated YouTube app for Windows Phone that provides the great experience our consumers expect while addressing the concerns Google expressed in May, including the addition of ads," part of a statement by Microsoft reads. The new YouTube app released yesterday comes with a new list of features, enabling Windows Phone users to live stream YouTube content and upload video to the platform. Google had previously demanded Microsoft pull its app due to it blocked ads. South Africa’s largest ad network alternative to Google and Nigeria’s largest ad network alternative to Google, Ad Dynamo has announced that it is prepping to enter Kenya in early September. With MSN Kenya secured as an exclusive publisher for Kenya already, Ad Dynamo will commence serving advertisers immediately. It will offer advertisers in Kenya a compelling solution that provides convenience and scale of reach. 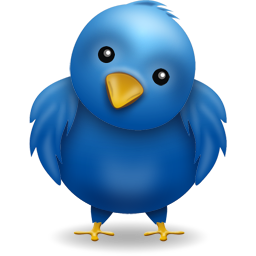 It’s product set that will be released in full in Kenya includes: Mobile ad network, Online ad network, Official Twitter advertising products available in Kenya through Ad Dynamo – Promoted Tweets and Promoted Accounts. Others include Facebook advertising, Sponsored Tweets – pay celebrities to promote your brand; Local Kenyan publishers will enjoy the fact that Ad Dynamo pays faster than any rival ad network worldwide, and even offers its very own Visa Debit Card as a means of receiving your income. Nigeria’s Federal Capital Territory, Abuja could not deter thousands of youths that recently stormed the Nicon Luxury Hotel regional audition venue of Maltina Dance All (MDA), the highly celebrated family dance show, to showcase their dancing talents as the quest to select family representatives for the Maltina dance academy continues. At the end of the long hours of competition, not even the rains could stop the nine finalists that emerged in the future battle for the grand prize and the highly coveted title of Nigeria’s number one dancing family. The huge turnout and skill exhibited by contestants- also affirmed by the judges – showed that the Abuja participants have really come of age and improved in the MDA 7 selection session compared to previous auditions. Aptly dubbed “The Evolution”, the auditions did not disappoint as some of the contestants promised to bring the title “up North”. At the end of the gruelling and competitive dance sessions, the judges - Muyiwa Osinaike, Bimbo Obafunwa and Ukalina Opuwari – selected nine out of the hundreds of contestants that participated. The nine are: Abiodun Ibrahim, Ivory Dosa, Patience Ebute John, Tije Manari, Longret Masamari, Uchendu David Segun, Ude Jane, Godwin Clement and Ezekiel Chika. Muyiwa Osinaike, the lead judge at the audition, rated the overall performance of the Abuja contestants as above his expectations. “The Abuja contestants seem to have exceeded my expectations. Judging from last year’s audition, the Abuja contestants have made great improvement which is very good and I must commend them.” He further encouraged the dancers to always practice dance steps in all genres of dance - if they alongside their families must win the N6 million and a brand new car which is the grand prize for the MDA 7. “To survive in the Maltina academy as dancers, you must work at being an all-rounder in dance which is what the Maltina Dance All is all about.” Osinaike added. MasterCard has appointed Ezediashi Ofili as Vice President and Business Leader to drive the growth of its Prepaid Business in sub-Saharan Africa. He will also oversee MasterCard’s Global Products and Solutions team in the region. Ofili joins MasterCard from Access Bank PLC where he was the Head of Business Engagement for Northern Nigeria. With more than twenty years’ experience in the banking, energy, Information Technology and credit rating sectors in both Africa and Europe, Mr. Ofili has played a key role in several major projects most recently the launch of the Nigeria National Identity Card project. MasterCard is seeking to expand its prepaid product offering in the region and has partnered with several financial institutions to drive this strategy. Commenting on the appointment Daniel Monehin, MasterCard’s Division President sub-Saharan Africa, said growing the prepaid business in Africa would bring more people into the formal financial system thereby increasing levels of financial inclusion in the continent. “We are happy to welcome Mr. Ofili to the MasterCard team. As we work towards realising our vision of a world beyond cash we acknowledge that Africa’s position as an emerging market provides increasing opportunities for the growth of prepaid card payments, especially as the market begins to witness a shift from cash to cashless transactions,” said Monehin. Mr. Ofili is a qualified Petroleum Engineer from the University of Ibadan, and is also a Microsoft Certified Engineer and Project Management Professional with PRINCE2 certification. In addition to that he holds a Master’s degree in Business Administration – Strategic Management of Technology – from Cass Business School in London. “The potential for Africa to become as technologically advanced as its counterparts in the developed world in the area of payments is enormous, and I look forward to contributing to this growth,” said Ofili following his appointment. The African Innovation Foundation (AIF) has announced 31st October, 2013 as deadline for call for entries for the 2014 Innovation Prize for Africa (IPA). The prestigious Prize, presented annually since 2012, aims at encouraging innovations that contribute to sustainable development in Africa. The winning submission will be awarded a prize of USD 100, 000, with two additional USD 25, 000, one for the runner up with an innovation with the best business potential and the other one for the runner up with the innovation with the best social impact. The IPA 2014 competition focuses on five priority areas, namely manufacturing and service industry, health and well-being, agriculture and agribusiness, environment, energy and water and ICTs. Eligible innovations must be by Africans for Africa. Africans in the Diaspora can also apply if their innovations are of significance for Africa. The innovation or associated business must be registered in Africa. Etisalat has announced the launch of its Machine-to-Machine (M2M) Control Center, which allows enterprise customers to activate, manage and rapidly scale connected device businesses or deployments. With Etisalat’s M2M Control Center, customers can now manage your connected M2M deployments with complete ease and control. According to Abdulla Hashim, Senior Vice President, ICT, "Etisalat's ICT team continuously strives to provide solutions and add value to businesses by providing the latest M2M services. With the automated and intelligent solutions of the M2M Control Center, businesses in the UAE are now empowered more than ever to get to market quickly, run operations efficiently and grow their business profitably. " The launch of the M2M Control Center will enable enterprise customers to automate processes to streamline operations and scale faster.' The M2M Control Center enables businesses to further drive efficiency and profitability with custom device provisioning and usage controls. Enterprise customers can also make intelligent management decisions with real-time diagnostic tools and detailed billing and usage reports. Etisalat's M2M Control Center is powered by Jasper Wireless-a hosted and secure platform which delivers authentication, real time usage and management of M2M connected devices, enabling enterprise customers to manage their connected M2M deployments with complete ease and control. Since the discovery of Ukalina Opuwari - whose family, the Opuwari family won Season Two of Maltina Dance All (MDA) - the Maltina brand has been in constant search for raw talents, 25 of whom were promising talents discovered at the just concluded Maltina Dance All season seven regional auditions dubbed “The Evolution” - which took place across some major cities in Nigeria. Ukalina, it would be recalled, later became the first Nigerian female to be certified in Latin/ballroom by the IDSF/IDAT in Beirut Lebanon and one of the judges at the auditions. Since the discovery of Ukalina, more talents have been thrown up by the Maltina Dance All reality TV show. Following this, Consumers have commended the brand for providing the platform that led to discovering the likes of Lemmy Adejoh, Opus Green and others who all have the potentials of dancing on the world stage. At the Lagos audition, eight promising dancing talents - Blessing Ekpo 21, Gloria Idundun 24, Promise Enweribe 23, Peter James 22, Aniebet Emmanuel 22, Emmanuel Ibeotuche 21, Jackson Obinna 23 and Ekwerre Elijah 24- were identified and selected. Promise Enweribe, an undergraduate and one of the qualifiers that demonstrated raw talents and was selected revealed that over the past four years, Maltina has motivated him and his friends to work extremely hard, two of them eventually made it this year. “For four years now my friends and I have been working tirelessly to stand a chance to feature in the Maltina Dance All show. We enrolled at a dancing school practicing and learning dance styles, we also spend most of our time in the gym to be in good shape. I am extremely happy that today all my efforts have paid off and I was selected”. Aniebet Emmanuel a Business Management student of the National Open University of Nigeria (NOUN), Peter James, a polytechnic student and Gloria Idundun, a 24 year old make-up artist also made it to the last eight. They were commended for having the potentials of entering the Maltina dance academy. Aniebet said thousands of contestants come every year to stand a chance of entering the academy, but they never make it. “I always knew that if I am to stand a chance at all, I would have to work very hard, which I did and I was selected”. Although a professional dancer, it took Peter James three years of spirited efforts to be selected which points to the highly competitive nature of the MDA. These and other talents from other regions would now be groomed, and who knows, a potential Ukalina may already be in the works. Emirates, one of the world’s fastest growing airlines today announced that it will start to roll-out Google Now™ cards for their passengers who book via Emirates.com. Yesterday, British Deputy High Commissioner, Peter Carter paid a courtesy visit to Guinness Harp Brewery in Ogba, Lagos. Peter Carter and some Guinness management team visited some departments in the company during the visit. From Left, Chairman Guinness Nigeria Plc, Babatunde Savage, British Deputy High Commissioner, Peter Carter and Managing Director/Chief Executive Officer Guinness Nigeria, Seni Adetu, During the Courtesy Visit of the British Deputy High Commissioner to Guinness Harp Brewery , Ogba in Lagos on Tuesday. 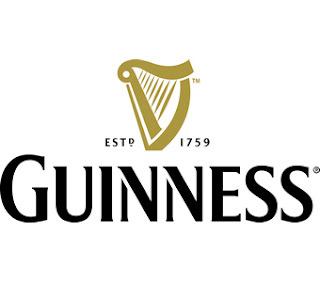 From Left, British Deputy High Commissioner, Peter Carter, Chairman Guinness Nigeria Plc, Babatunde Savage and Managing Director/Chief Executive Officer Guinness Nigeria, Seni Adetu, During the Courtesy Visit of the British Deputy High Commissioner to Guinness Harp Brewery , Ogba in Lagos on Tuesday. Samsung Electronics has launched a new bottom-mounted refrigerator to its range of brands - giving its customers more options to choose from. According to Product Manager, Refrigerators, Samsung, Manmohan Chandroth, with the new refrigerator, Samsung brings powerful technology innovations into the home, empowering families to get more out of their appliances and enabling households to run more efficiently and harmoniously. 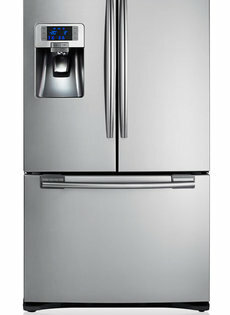 The new refrigerator features Samsung’s superior digital inverter compressor that strengthens durability and improves energy efficiency and cooling performance by automatically adjusting across five speeds of RPM in response to cooling demands. Emirates Airline and the New York Cosmos football club have announced a sponsorship deal to make Emirates a Founding Partner and jersey-front sponsor of the club. The Cosmos began play in 1971, spending 14 seasons in the earlier NASL, winning five Football Bowl trophies and bringing some of the biggest names in world football history to North America including Pelé, Franz Beckenbauer, Carlos Alberto and Giorgio Chinaglia. The Cosmos last won the NASL Football Bowl in 1982. It’s been nearly 30 years since the Cosmos, an iconic global football club, have played in a professional league. Yet throughout their absence, the club has maintained a loyal and dedicated fan following. On 3 August the New York Cosmos returned to the NASL in their first official season match against the Fort Lauderdale Strikers, winning 2-1. As Maltina Dance All (MDA), the popular family dance TV show enters a critical selection stage; Nigerians are awaiting with bated breath the ten families that would eventually make it into the Maltina dance academy in September. The show which is sponsored by Maltina, a premium malt brand from the stable of Nigerian Breweries plc has over the years carved a niche for itself as the most popular family dance show on TV and a platform which young dancers have used to realize their ambitions. The show, according to Mrs. Ngozi Nkwoji, Senior Brand Manager, Maltina is all about the emotions, excitement, fun and the unbreakable bond that ten families will showcase when they challenge themselves by learning and performing new dance styles in the Maltina dance academy. Apart from showcasing their dancing skills, families are taken through other skills that are needed for family harmony and unity in an atmosphere of vivacity and camaraderie. When the show made its debut in 2006, Catherine Edoho was the anchor for seasons one and two; she handed over to Tope Oshinogun who held the forth for season three while Kemi Adetibe anchored seasons four through six. Kemi Adetiba who had successfully been the anchor of the show for three seasons and in the process has warmed herself into the hearts of Nigerians would be passing the baton to delectable Osas Ighodaro, Miss Black USA 2010/2011 and the first Nigerian-American to be so crowned. Kemi, who is moving on to conquer other challenges said she would miss the thrills and frills of the show, especially the bitter sweet emotions that often follow each eviction show. But she assured Nigerians that Osas is coming with a wealth of experience and will equally warm herself into their hearts. No doubt, Osas - as she is popularly called – would be bringing a wealth of experience garnered over the years to bear on the MDA platform which has also grown to become the number one family entertainment show on Television because its viewership cuts across various age grades. Apart from being a successful model, Osas is also an actress and has been in the entertainment industry, both in the United States of America and Nigeria since 2005. What most people may however not know about Osas is that she is also an entrepreneur. “I am an entrepreneur and I grew up watching and helping my father run his businesses abroad. I have my degree in broadcast journalism and dual minor degrees in entrepreneurship and theatre from the Pennsylvania State University. I got my masters of fine arts in acting from the Actor’s Studio Drama School at Pace University”.